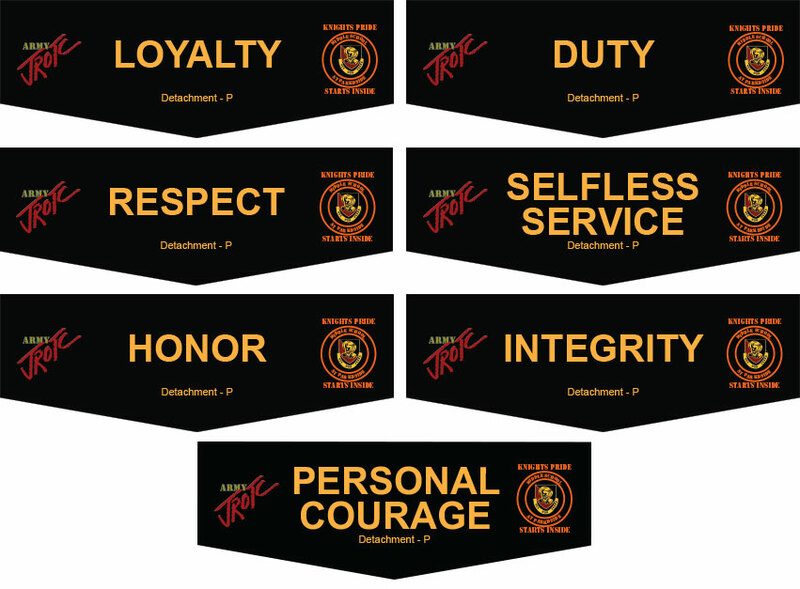 We have two options available for the 7 Army values banners. We offer one sided banners with grommets in the corners, which is great for hanging on the wall. We also offer two sided banners with a pole pocket on top (hardware included) which is great for hanging from the ceiling. What are the 7 Army values? Bear true faith and allegiance to the U.S. Constitution, the JROTC, your Company and other Cadets. Bearing true faith and allegiance is a matter of believing in and devoting yourself to something or someone. A loyal Cadet is one who supports the leadership and stands up for fellow Cadets. By wearing the uniform of the U.S. Army you are expressing your loyalty. And by doing your share, you show your loyalty to your unit. Fulfill your obligations. Doing your duty means more than carrying out your assigned tasks. Duty means being able to accomplish tasks as part of a team. The work of the U.S. Army is a complex combination of missions, tasks and responsibilities — all in constant motion. Our work entails building one assignment onto another. You fulfill your obligations as a part of your unit every time you resist the temptation to take “shortcuts” that might undermine the integrity of the final product. Duty also requires you to work hard everyday to be a better Cadet. Live up to Army values. Honor is a matter of carrying out, acting, and living the values of Respect, Duty, Loyalty, Self-Less Service, Integrity, and Personal Courage in everything you do. It is ALWAYS doing what is right even when no one is looking. Do what’s right, legally and morally. Integrity is a quality you develop by adhering to moral principles. Once lost, it is the hardest to recover. It requires that you do and say nothing that deceives others. As your integrity grows, so does the trust others place in you. Trust is one of the most important things in our profession. The more choices you make based on integrity, the more this highly prized value will affect your relationships with family and friends, and, finally, the fundamental acceptance of yourself.